Macquarie Island is composed of a complete section of oceanic crust that formed in a slow-spreading mid-ocean ridge 2.0 to 3.5 km below sea level. Vitriclastic facies preserved on the island have both pyroclastic and hyaloclastic characteristics. Monomict hyaloclastic breccia facies are widespread across the island and are predominantly composed of near-primitive (~7.9 wt% MgO) subalkaline/transitional (~0.7 wt% K2O) sideromelane shards and crystalline basalt clasts with low vesicularity (LV, < 15% vesicles). Breccias are thick bedded and structureless with matrix-supported angular pillow fragments, bomb-sized fluidal mini-pillows, and globular glass lapilli. Clasts are lithologically similar to interbedded pillow basalts and laterally grade into fine-grained sandstone facies. These sandstones are normal-graded, well-laminated, thin bedded, and interstratified with red pelagic mudstone. Lithofacies associations indicate that the hyaloclastic breccias were formed proximal to a source vent via quench-fragmentation, and subsequently reworked by ocean-bottom currents into distal epiclastic sandstone facies. During eruption, co-genetic pillow lava and hypabyssal intrusions mingled with the breccia, forming fluidal peperite. Rare polymict pyroclastic facies only occur in the highest stratigraphic levels and are mostly composed of highly vesicular (HV, 15–50% vesicles) sideromelane shards and crystalline basalt clasts with alkaline (~1.0 wt% K2O) fractionated (~6.8% MgO) compositions. Minor lithic grains are composed of subalkaline (~0.7 wt% K2O) to very highly alkaline (~1.7 wt% K2O) LV sideromelane shards, and amphibole-bearing diabase. The pyroclastic facies contains medium to thick beds of lapilli-tuff that exhibit both reverse and normal grading, diffuse lamination, and planar-grain fabric. These beds are locally overlain by thin fine-grained tuff beds entirely composed of cuspate to very thin elongate bubble-wall shards. These characteristics indicate that explosive deep-marine eruptions produced high-density coarse-grained gravity flows that were covered by slower suspension settle-out of delicate bubble-wall shards. 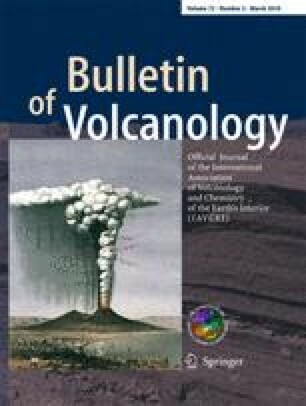 Stratigraphic relationships suggest that explosive eruptions started during the waning stages of more alkaline volcanism along the proto-Macquarie spreading center. The online version of this article (doi: 10.1007/s00445-009-0312-8) contains supplementary material, which is available to authorized users. The authors would like to acknowledge I. Skilling, D. Maicher, and JDL White for providing comments that greatly improved this manuscript. We thank the Australian Antarctic Division (AAD project number 2515) and the Tasmanian Parks and Wildlife Service for providing support and access to our remote field locations on Macquarie Island during summer field seasons of 2006 and 2007. We thank the crews of the Marina Svateava (summer 2006) and the Spirit of Enderby (summer 2007) along with Aurora and Heritage expeditions for providing transport to Macquarie Island. N. Pearson provided numerous insights and instrumentation support for the geochemical aspect of the study. This project was supported by an ARC discovery grant to NRD and JAD (DP0663373). This is contribution number 581 from the ARC GEMOC National Key Centre (www.es.mq.edu.au/GEMOC/).